One of the feared injuries for pitchers, tennis players, and other athletes is a rotator cuff tear. When a tear of this muscular structure is severe, it can end the player’s career. The rotator cuff is a group of muscles and tendons that converge around the upper region of the humerus (upper arm bone). These structures form a cuff that holds the arm in place and permit movement in varying directions. Too much stress on the shoulder joint can lead to swelling and partial tears in the rotator cuff tendons. When one or more of these tendons pulls away from the bone or tears, it is considered a rotator cuff tear. Here are the top five things you should know about a rotator cuff repair. 1. Who is at Risk for a Rotator Cuff Tear? Athletes are the most prone to getting rotator cuff tears. They include swimmers, baseball players (especially pitchers), tennis players, and football players. Other people are at risk for this type of injury also. A tear can occur from using your arm to break a fall, falling on the shoulder, lifting heavy weights, and degenerative tearing of the cuff. 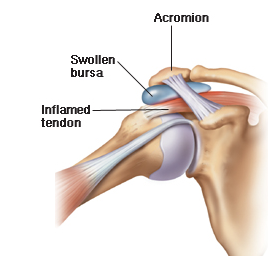 Most rotator cuff tears are the result of wearing down of one or more of the tendons over time. This occurs with age and from heavy use of the shoulder. Repetitive stress on the shoulder occurs from throwing a baseball, pitching, playing tennis, rowing, and lifting weights. Also, bone spurs can put someone at risk for shoulder impingement, which over time, weakens the tendons and causes tearing. 2. What is involved in Rotator Cuff Surgery? During the rotator cuff repair procedure, lose fragments of bursa, tendon, and other debris are removed from the shoulder space. This process is called debridement. Also, to make more room for the tendons, the surgeon may have to shave bone or remove bone spurs from the shoulder blade, which is called subacromial smoothing. Additionaly, the torn edges of the supraspinatus tendon may need to be sewn together and attached to the humerus. With the open surgery procedure, the surgeon makes a two to three inch incision in the shoulder. With the mini-open procedure, a smaller incision is made so the surgeon can reach the tendon by splitting the deltoid muscle. The mini-open surgery often requires a shorter stay in the hospital compared to the open procedure. Also, rotator cuff tears are repaired by arthroscopic surgery in some cases. General anesthesia or a nerve block must be used for the procedure. 3. What occurs after a Rotator Cuff Repair Procedure? You can expect mild discomfort after the rotator cuff repair, but the surgeon will prescribe analgesic medications for this. The arm will be placed in a sling to prevent risk of injury, and physical therapy is ordered for rehabilitation. When you awake from anesthesia, the therapist has you start doing flexion and extension exercises of the hand, wrist, and elbow. The day after surgery, the therapist begins passive exercises of the shoulder. You are sent home and are expected to follow up with the physical therapist. He/she will teach you active exercises, where you move your shoulder and arm yourself, as well as stretches. This will start four to eight weeks after the procedure. The therapist will have you begin using light weights and progress to heavier ones to regain strength in the shoulder. 4. What are the Risks of Rotator Cuff Surgery? Rotator cuff repair is done for tears that can occur from sudden injury or degeneration that occurs from stress and strain. The repairs for large repairs are now always successful, however. When the tissue is frayed or thin, the repair surgery is not as likely to work as when the tissue is healthy. There are several risks associated with a rotator cuff repair procedure. These include infection of the surgical incision, blood loss, anesthesia complications, pain and stiffness that persists, damage to the deltoid muscle, injury to one or more of the tendons, nerve or blood vessel damage, and complex regional pain syndrome. 5. When is Rotator Cuff Surgery Deferred? Rotator cuff repair is not always done when there is an injury or tear. Very large tears (greater than two inches) often cannot be repaired. Also, people who are not active and older than 60 years often do not improve with the procedure. In these cases, rotator cuff surgery can cause signficant weakness and pain. For some patients, the orthopedic surgeon with do arthroscopic debridement to smooth the shoulder region so that surgery is not necessary.